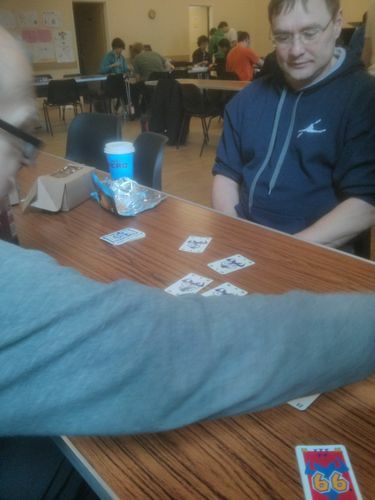 "The well known 'Zoch Chickens' turn up in a hectic dice battle in Heckmeck Am Bratwurmeck. Two to seven players 8 and up try to obtain fried worms for their chickens, so that they don't go hungry. Of course, anyone who doesn't manage to grab a worm off of the grill can help himself to those of his opponents. 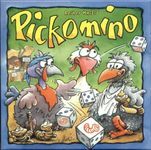 This fast-paced game by Reiner Knizia is, like Hick Hack im Gackelwack, a gambling game in the finest chicken tradition." This game is a push your luck game and is a basic dice-roller to build a good total to take the numbered tiles to get the most worms. Failure to take a tile means you put one back and the highest tile is turned face-down. 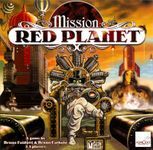 In Mission: Red Planet, players work as mining companies compete to send astronauts to Mars in order to colonize and mine for recently discovered materials. 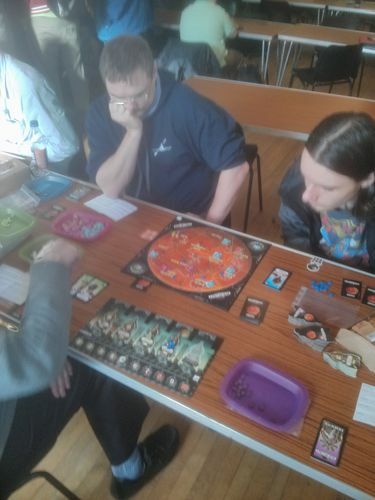 Over the course of 10 rounds, players play one of their special agents every round to help fill the rockets heading to Mars with their own astronauts while simultaneously working to prevent their opponents from doing the same. Once landed, these astronauts must gather to control specific regions of the planet, each yielding one of the three resources: Celerium, Sylvanite, or Ice. After rounds 5 and 8, players gain score tokens for every region where they control the majority of the astronauts. At the end of the game, players score one final time, adding any bonuses received from Discovery Cards and Bonus Cards. The player with the most score tokens at the end controls Mars, and all the riches it can bring!" Dave score depends or if he scored as per his target or the opposite of his target ie either zero or eight. "Captain Swallow has always dreamed of pocketing a large nest egg in order to retire on a remote island – but he never counted on stiff competition from Captains Stanley Rackum, Dirk Chivers and others, greedy and cruel enemies who always manage to attack the same ships as him. If he wants to finally sink back and enjoy peaceful days in the sun, he must become the most cunning pirate! 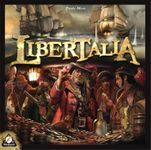 In Libertalia, you must thwart the plans of competitive pirates over the course of three rounds while using cards that show the same crew members as your piratical comrades-in-arms. Yes, not only do they attack the same ships, but they employ the same type of ravenous scum that you do! Can you take advantage of the powers of your characters at the right time? Will you be outdone by a pirate smarter than you? Jump into the water and prove your tactical skills!" "In the card-driven board game Rialto, the goal is to earn the most victory points (VPs), which are awarded for a variety of things. The game board displays the six districts of Venice, and players earn VPs for placing council members into these, for building bridges and placing gondolas to connect the districts with one another, and for building advantageous buildings. 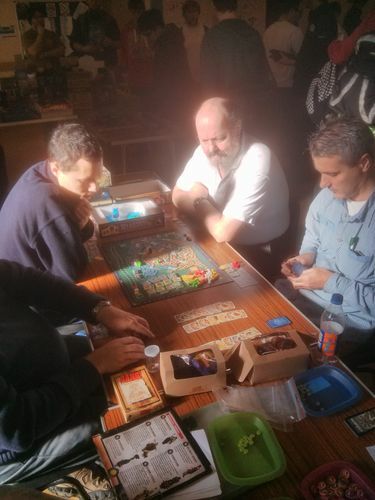 Players collect VPs both during the game – from special buildings and by building bridges between districts – and at the end of it – for majorities of council members in each district. The value of each district evolves during the game: Each district is adjacent to four other ones, and at the end of the game, they will be connected either via bridges or gondolas. A bridge increases the value of the adjacent districts by 3-6 victory points, whereas a gondola increases this value by 1 point. The player with the most council members in a district earns VPs equal to the district's total value, the player with the secondmost council members earns half this value, and so on. While it's important to establish majorities in the districts, it's also crucial to control their values by cleverly placing those bridges and gondolas." Did not play Any comments? "Rome, 1655 Anno Domini. An announcement shocks the whole of Christendom - Pope Innocent X has died. With lightning speed, Cardinals travel to Rome, the center of religious power and intrigue. The suspense is palpable when the players take on the roles of Preferiti - the most likely candidates to ascend to the Holy See - and try to gain as many votes as possible, using bribery, beguilement and tactical calculation. In the end, only the Cardinal with all the votes money can buy as well as proven mastery on the political stage will be elected Pope. One thing is for certain: Once the white smoke rises, everybody will know: "Habemus Papam! We have a Pope!" 1 rules booklet, 1 information sheet. In 1655 - Habemus Papam, players are at a papal election. The conclave of 1655 is the theme in this new card game from DDD Verlag. Here - players will try to have the most votes and see the rise off the white smoke. Whoever as the most votes wins and is proclaimed the new pope."